A source within French retailer Micromania may have spilled the beans. Or should that be haricots? 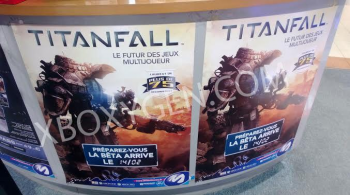 If these pictures are to be believed, Titanfall will have its beta test this February. It seems like only yesterday ... well , it seems like only a couple weeks ago we were talking about alpha trials. Truly, time flies when you're having mech-related fun. The leak comes courtesy of Micromania, a French wholly owned subsidiary of GameStop. Since this is coming from a retailer and not the developer or publisher it can't be regarded as official info, but let's face it: if this thing's going to meet its March launch it needs to test at some point before then. Still, beta? What about those invite-only alpha trials? At what point does this stop being testing, and start being advertising? Titanfall's due early March 2014 for PC, Xbox 360 and Xbox One.